Welder Eric Thelander’s dedicated experimentation resulted in his development of a photo-etching technique combining technology from screen-printing and intaglio print-making. 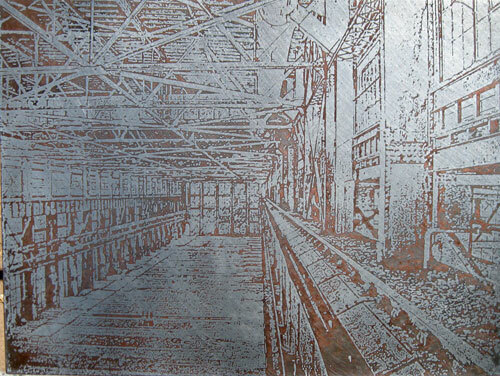 The process involves etching a photograph into galvanized sheet metal, and then plating it with copper. The resulting sheet of metal—and its photographically detailed relief—is virtually indestructible. This isn’t the screenplay. Elizabeth Taylor isn’t here, and Paul Newman isn’t involved. Tennessee Williams’ play is represented here as he wrote it—and not as Hollywood portrayed it. The Albuquerque Little Theatre wants you to know that the stage version is the best version and from my vantage point, their boast is dignified and true. It is that special time of year when winds blow strong, flowers begin to bloom, and TEDxABQ accepts applications for speakers with big ideas.